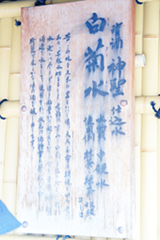 Genbee Yamamoto established Yamamoto Honke in Fushimi, Kyoto. A disastrous war was fought in the Toba-Fushimi area between forces loyal to the Tokugawa shogun (supreme military commander) and the allied forces of the domains of Choshu, Satsuma and Tosa. The battle lasted for four days, ending in a decisive defeat for the Tokugawa shogunate forces. This battle left scars in the beautiful scenery, and almost every building in the region, including our sake brewery, was burned to the ground. With the great support and efforts of the local people, Yamamoto Honke rebuilt its brewery and resumed production within the same year. Because of Fushimi’s inland geographical location, the main transportation routes for distribution of our sake were via the Takase River and Yodo River that flowed through Fushimi and connected Kyoto with Osaka. With the development of the automobile and railroads during the Meiji period (1868-1912) Yamamoto Honke determinedly extended its market eastward, to the Tokyo area. 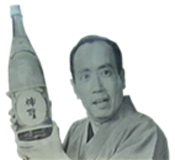 With its growing success, our sake became well-known throughout Japan, and its signature brand, "SHINSEI (神聖)" became famous. The 8th generation Genbee Yamamoto was well known for his talents and profound interest in "Sado" (茶道 Japanese Tea Ceremony) and "Waka" (和歌 Japanese poetry) and associated closely with the Omote-senke family and other notable figures of the era. Genbee's associates included Tomioka Tessai, one of the most famous Japanese artists of the Nihonga style. In celebrating Genbee's marriage, Tessai took his brush and painted "Shinsei" （神聖), letters to give as a wedding gift. Today, the letters are used on the Shinsei lable. Our official TV advertisement using Jyunzaburo Bando, a famous comedian, was a great hit and contributed significantly to the promotion of Yamamoto Honke's brand name throughout Japan. While honoring and preserving the traditional methods of sake brewing inherited from our predecessors, Yamamoto Honke also has been keen on finding new ways to take advantage of recent advances in biotechnology to enhance the quality of our sakes. Long years of research resulted in our receiving in 1996 the pretigious EDA award, the most respected prize in the Japanese brewing industry. The EDA award is an Encouragement Award of the Society for Biotechnology Japan (SBJ), which is awarded to encourage SBJ members in the early stages their careers who have made major contributions to the theory or technology of brewing. In honor of the 8th Genbee Yamamoto's friendship with Tessai Tomioka, we released the "Tessai" series of sakes to celebrate the 300th anniversary of the founding of Yamamoto Honke brewery. This series was created to be served during the Chakaiseki (tea ceremony meals) for Omote senke (one of the three houses that trace their roots back to Sen no Rikyu, founder of the Way of Tea). The label was designed by the master of Omote senke. 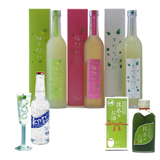 From the Omoi-series, a mixture of Junmai sake and natural juice of fruits (yuzu, sudachi, ume) to Kyoto-cider (Juinmai sake and pops) and Matcha no osake (Junmai sake and green tea), Yamamoto Honke has been a leader in the introduction of new types of sake with a lower alcohol content. The key ingredient in the superlative sakes of Fushimi is the unique spring water that is found nowhere else. According to tradition, during a time long ago, villagers in what is now the Fushimi area were tormented by a terrible draught that lasted for weeks upon weeks. Many crops were ruined. One day, a young villager went into the mountains to seek a solution. As he was walking deep in the woods, he encountered an old wizard. The young man begged the wizard for help in dealing with the drought. The good wizard, who loved nurturing white chrysanthemums, sympathized with the villagers and decided to help them. As the wizard reached the village, he took out a chrysanthemum and tilted it slightly. One single drop fell from the petal to the ground. In the blink of an eye, clear water sprang from the dry land, and almost instantly, the region was enriched with the water from chrysanthemum. Today, this area is known as FUSHIMI and it still benefits from the rich "chrysanthemum" water.